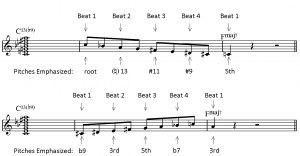 The diminished scale is one of the most useful and versatile tools for jazz improvisers. It has been covered on LJS before, but I want to try to offer an additional perspective on how to think about and use this scale. You might already know about the diminished scale, but a lot of jazz musicians are familiar with the diminished sound and yet do not tap into the full potential of this unique scale. Likewise, you might already know how to play a diminished scale – but where do these scales come from, how are they theoretically derived, and what are their unique properties? In this post, I’m going to walk you through some basic answers to these questions and talk about the most effective ways to incorporate the diminished scale into your playing. What’s the history of the diminished scale? Diminished-like scales and other symmetric scales have been used in non-Western music for centuries (and perhaps even millennia). There a few freak incidences of diminished scales in earlier periods of European “classical” music history, but diminished scales began to appear more definitively as a distinct musical idea in Western music during the so-called “Romantic Era” in the 19th century, especially in the music of Russian composer Nikolai Rimsky-Korsakov and his students/imitators. By the early 1900s, the idea of the diminished scale began to be formally theorized and codified. During the first half the 20th century, composers such as Bela Bartok and Igor Stravinsky began to make extensive use of the diminished scale in their compositions. 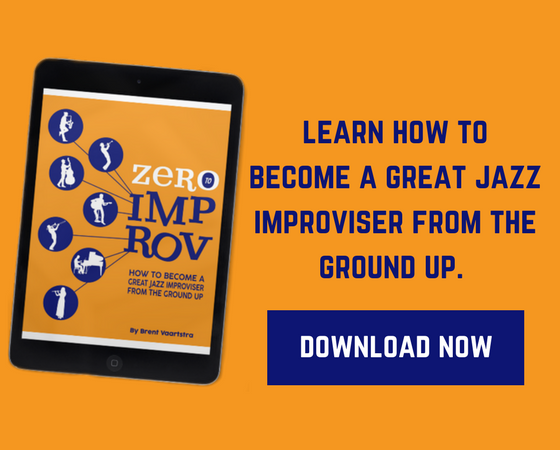 In jazz history, definitely by the time bebop emerged, many improvisers were aware of and using the diminished scale. What is a diminished scale and how are diminished scales derived? Also, be aware that the diminished scale is sometimes called the “octatonic” scale because it has 8 notes (“octa” = 8, “tonic” = tones), as opposed to other scales like the diatonic modes (or church modes) which have 7 notes or pentatonic scales which have 5 notes. What are the unique properties of the diminished scale? Diminished scales are symmetrical scales, meaning that they can only be transposed into another “key” a limited number of times before they repeat themselves – before you get the same scale with the exact same pitches, just starting on a different note. Since they are “limited transposition” scales, you can’t generate modes from diminished scales the same way you can with an asymmetric scale, such as the major scale (also called the Ionian mode). As it turns out, there are only 3 diminished scales. If you don’t believe me, try building diminished scales yourself and see how many unique scales you can generate before you wind up with a scale with the exact same pitches as the one you started on, just played in a different order. 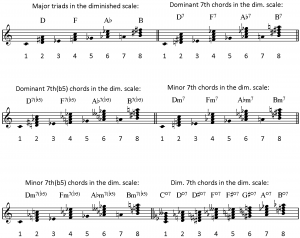 Diminished scales have a lot of built-in major triads and 7th chords. Using only notes derived from a given diminished scale, you can extract a lot of useful and familiar-sounding harmonic structures. 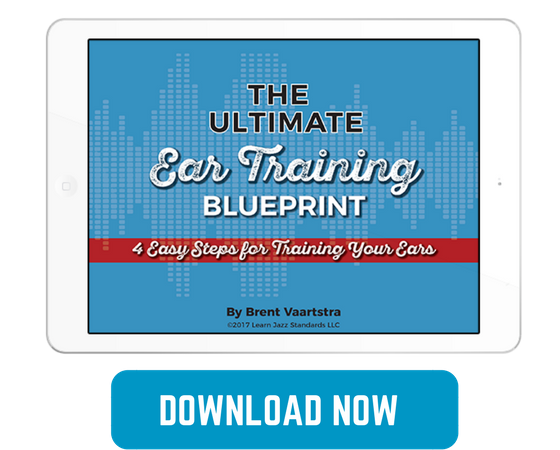 This is useful – one of the best ways to tap into the “diminished sound” is to play melodic patterns based on the internal structures of the diminished scale, as opposed to just running up and down the scale in stepwise motion. There are a few other types 7th chords you can extract from the diminished scale – see if you can find them for yourself: diminished major 7th, minor (major 7) b5, major 7 (sus 4) #5, and major 7 (sus 4) b5. How do you use diminished scales? I hope you find this a helpful guide for exploring diminished scales. Be aware that there a number of exotic sounding melodic patterns you can create from the diminished scale because it is symmetric – see if you can come up with your own patterns, and happy practicing! Thanks for the added explanation. I'm not sure why the diminished scale works differently ascending or descending, but it does sound right when I play it the way you suggested. I also assume the "start with a hole note" rule (I realize it's just a guideline!) applies even if you are starting a phrase on something other than the root of the chord? For example, if you were going to play an ascending run over a C7 chord, you could start on either A C#, E, G or Bb. You explanation for why it's good to start the diminished scale with one of the whole steps is a bit confusing. You suggest this brings out "good" notes on the beat, but in the ascending diminished scale example you emphasize the exact opposite notes of those emphasized in the descending diminished scale?! I was about to say the same thing. I like the post a lot overall, however, I think his intention may have been to use the half whole scale on V7b9 chords. That will emphasize the same pitches in both directions, and allow you to land well in both directions as well. i.e. start on C ascending and descending. I absolutely see how this can be confusing, and I'm using language here in a certain way on purpose to make a theoretical point. Please allow me to clarify further if I can. When using a descending diminished scale over a dominant 7th chord, you start on the root and follow the whole-half-whole-half… (etc. )… interval pattern. If you look closely, you end up with a C# diminished scale played in descending stepwise motion starting from C. You play this exact same scale ascending starting on C# (C# diminished ascending over C7) to get the "optimal alignment" of colorful tones (see the final notated example above for a visual). I know it seems counterintuitive because of the complementarity of the notes on the beat (different pitches are emphasized whether ascending or descending if you always start with a whole step while moving melodically in either direction), but the fact is that ascending and descending scales often simply do not behave the same way in terms of their harmonic implications. 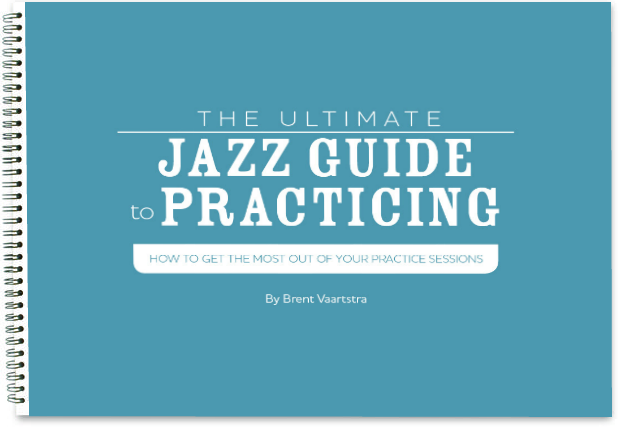 Don't take my word for it, try it for yourself and check out great jazz professionals' solos to see how they deploy the diminished scale. And as always, take this with a grain of salt, it's not the only way to think about this, and in real-life playing situations there are so many other factors that go into the construction of a jazz melody on the spot. My hyper-picky theoretical distinction is this: one of my mentors is an influential jazz theorist named Gary Keller (he has a great book about jazz theory published through Advance Music if you're interested), and he and others argue that there is only one type of diminished scale: the "whole-half." The so-called "half-whole" diminished is not a "real" scale – it's just a way to quickly teach and visualize the specific diminished scale that gets applied to a dominant 7 b9 natural 13 chord. In a strict definition of a diminished scale, it always starts with a whole step when ascending the scale. You can buy this theoretical argument or not, but I chose to stick with this theoretical viewpoint, and that's why I explained it the way I did. I hope this helps – and thanks for your comments! Josiah – thank you for the explanation. I see where this concept of a 'single diminished scale' comes from and you know – you opened my eyes with this! Instead of learning 2 versions it's easier to start the same scale on a different degree of the target chord (or even the whole progressions) and them get busy with something else.